David Phillipson earned his 'Dangerous Dave' nickname for good reason. There's little doubt a few of the "160 or so" breaks he has suffered since being diagnosed with brittle bone disease at the age of three-and-a-half could have been avoided with a more cautious approach to life. 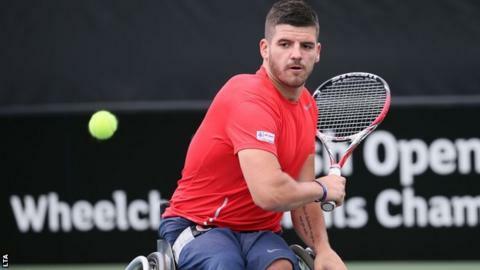 But one of the world's top wheelchair tennis players has always pushed the boundaries with his condition and loves to take risks. It's just his way. And at least he has a strong comeback if his mum Anne starts nagging. It's in the genes. "Mum's a tough old cookie," Phillipson told BBC Sport. "She has done parachuting to raise money for my treatment, she has fought for me, gone to court to get me into a school and done so much for me. And she is still over-protective - even though I am 25. "She still owns her own business, she has horses and is just non-stop. She is a very energised woman." The energised approach is one the Bingham-based British number three and world number 17 follows. As well as a total of 18 career ranking title wins, two-time Paralympian Phillipson has also represented GB juniors at basketball, a sport he has recently taken up again. He finds it helps mix up his training, maintains his speed around the tennis court but, as much as anything, because he "loves it", enjoys the social side and is a self-confessed fidget. It was his dad Mike who saw the all-round sporting promise in the young Phillipson and encouraged it. "My dad was one of those guys who said he didn't want me on street corners at 16," the 2014 World Team bronze medallist said. "He wanted me to do something with my life. "At six he got a racquet and ball, saw I had good hand-eye coordination so I was doing badminton and swimming and got to a pretty high standard. "I tried all sorts of sports but it got to a point where I had to decide. It came down to basketball or tennis and I chose tennis. "But, after London 2012, I missed the fitness side of basketball so am back playing with my old team in Newark. It keeps up my fitness." Although he has impressed on the basketball court, it's at tennis that Phillipson stands out. But the former British number one and world number 11 feels there is plenty still to achieve. A wrist injury (tendonitis leading to a stress fracture) meant he slipped down the rankings but he feels he is progressing nicely again after missing nearly four months from December. He feels he is playing well and is expecting some good performances in upcoming events in Canada and the US. Osteogenesis Imperfecta (OI) is a genetic condition present from birth. Its most striking feature is that fractures may occur easily and is frequently called "brittle bone disease". OI is a disorder of collagen, a protein which forms the framework for the bone structure. In OI the collagen may be of poor quality, or there may just not be enough to support the mineral structure of the bones, making them weak and fragile and liable to fracture at any time even without trauma. The number of people with OI in the UK and Ireland is unknown due to it being difficult to diagnose. Estimates suggest approximately one in 15,000 people will have OI. No single test can identify OI so to diagnose doctors look at family history, medical history, physical examination, X-Rays and Dexa scans to assess bone density and genetic testing. OI is generally divided into Types. Type 1 is the mildest and most common form but the number of fractures varies greatly. "I feel like I am in top form but there is definitely more to come," Phillipson said. "The wrist is all good now." Being injury free means he can focus on climbing the rankings once again, regaining his place in the top 12 and plotting for a third Paralympics in 2016. "I am aiming for Rio," Phillipson added. "I need to increase my ranking because it has been sat just inside the top 20 for a while now, because of injury really. "The ranking points are not too far between 10-16. If I can break that top-eight barrier and get to Grand Slams then that will be a whole lot better." Phillipson is certainly not daunted by trying to break back into the sport's elite - he got used to pushing himself very early in life when it became clear he had brittle bone disease. And he has never let it affect the way he approaches life. "It doesn't scare me. If there is something I want to do it, I will do it," he explained. "Playing on centre court a couple of times at Wimbledon was amazing. I took out the the 13th seed. It was great because it was packed. I didn't look before and then I came out and I looked and thought 'bloody hell'. I play quite well with a crowd but I was a little bit nervous as well. I played in Beijing in front of big crowds too. I love it." "People say 'be careful' but I'm always thinking, 'I'll be fine'. I always wanted to do more than I could when I was a kid. "It developed when I was nearly three. Before then I was a perfectly normal child. But I broke my hip first and then I started breaking more and more bones. It took about a year to find out what was happening. "It got to a point where you just had to touch me and I would break, because the bones were so weak. "Over time I have broken roughly 160 bones. But, touch wood, not for about seven years, and I now have stronger titanium rods in my both legs. "Before that breaking bones was the norm." Unfortunately, "the norm" was often incredibly painful. "When I was about 13 I remember wanting to turn on the TV after school. I was on my hands and knees and heard something go. I broke my tibia and I was stuck and mum came in. "We had to get the paramedics to move me and I was just screaming. "Another time I went swimming with my dad and I was going through stages of walking and came out of the disabled toilet in the changing room and just went over and broke both my hips." Thankfully there has been a steady improvement over the years so the breaks have become less frequent. The big change started following a family holiday to Florida when he was about eight. "Mum found a leaflet for a guy in a children's hospital in Chicago who developed a tablet for kids with brittle bones," Phillipson said. "They were way in advance at that time and mum wanted to try everything. I got on well and had tests so I went year after year for check-ups." The treatment has led to a much improved bone density - from around 30-35% to 75% - and Phillipson said the experiences have strengthened his character as well as his body. "It has made me a stronger person definitely. I don't mind talking about it," he added. "I like sharing it with people who don't know. It's better to get it out there. "Some people are way worse off than me." It's an attitude and approach that has served him well. Read more on ParalympicsGB: Who will compete for Great Britain in London?